If Only Rocks Could Talk! 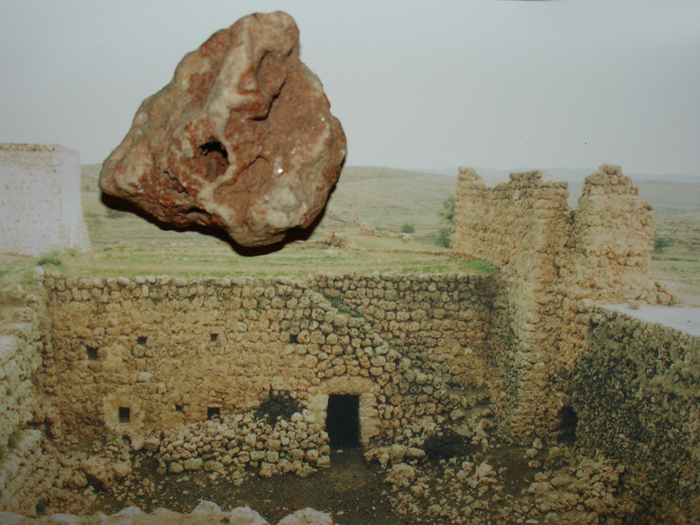 Sabri Atman's rock from Arbo, Nsibin, Assyria. by Nineb Lamassu, United Kingdom. Source: Zinda Magazine, December 24, 2005. Last week I had a visit from a friend: Sabri Atman, a friend of integrity and convictions. He was here to meet with both Firodil and Gomidas Institutes to discuss two special Seyfo events, which Firodil Institute together with Gomidas Institute are organising for this January to coincide with Britain’s official Holocaust Memorial Day. Whilst in London Sabri also met with prominent Assyrian personalities such as Rev. Dr. Khoshaba Georges, Mr. John Michael, and some active Assyrian youth. We also attended a special dinner organised by Gomidas Institute in honour of Prof. Hilmar Kaiser: a renowned historian and scholar who specialises in the genocide of 1915. During this dinner, Prof. Kaiser gave a short talk that touched on some changes in accessing the national archives of Turkey, which he described as, “a different side of the same coin”. He also gave a thorough analysis of the current politics in Turkey, and how these political maneuvers affect Turkey’s stance on the genocide of the Assyrians and Armenians. Later we all enjoyed the privilege of discussing many Seyfo queries with Prof. Kaiser. On the way back to my place, the central line on the tube (subway) was abuzz as usual, creating an uncomfortable environment. The train was crowded forcing one to withdraw into a peculiar state of alienation. Yes, alienation, not just from the crowded train but from the entire world. “Three months ago Prof. Yusuf Halaçoğlu, the chairman of The Society of Turkish History and Ankara’s denialist think tank, stated on TRT (A Turkish national channel that can be watched all around the globe); “We are well aware of the allegations made by the Assyrians, and we follow all their activities.” And he continued by saying; “We will invite Sabri Atman to this programme, and embarrass him by proving him wrong.” I am still waiting to receive the invite! When I receive it, that is, if I ever receive it, I will gladly advocate the just case of my people. That night I could not stop thinking about that little rock and its relationship with Sabri. It may be a little rock but it represents the survival and the struggle of a nation. It may be an inanimate thing but it gives strength and motivates a giant, a man who is as unbreakable as the little rock itself, a man who like the little rock represents the survival, struggle and the gallantry of an obstinate people who refuse to perish. Since that night on the train I can not stop thinking “If only rocks could talk” but I comfort myself by having the privilege of having two of them talk to me last week. How pleasant it is to converse with rocks.